According to his declaration, he said that the next Shiloh 2015 programme will start off by December 8th and end on December 12th, 2015. For those who does not know what the Shiloh program is all about should now be informed that Shiloh is a yearly church event of the Living faith Church always held at Faith Tabernacle Canaan Land Ota, Nigeria. Shiloh program always has several amazing testimonies from people around the world ranging from financial breakthrough, healing, salvation, knowlegde etc. Do not miss out in this year's Shiloh program termed; "From Glory to Glory". Last year it had a theme; "Heaven-on-earth." - Stay tuned to get Shiloh 2015 live updates from online broadcast and watch them on your computers (laptops and desktops). This is the Shiloh 2015 programme highlights (as shown in Living Faith Church Live broadcast - Winner Chapel TV stations) for all those people that will be traveling to Canaanland, Ota and for all those that will be watching the event live on Television or Live Streaming. Shiloh 2015 Morning Session – Please note that the Morning session of Shiloh 2015 live broadcast is always scheduled to kick-off by 7am. This is the morning session of the event and the session will last between 7am and 11am. This session will contain a series of 3 Teachings of the Bible. Shiloh 2015 Healing School – You should be informed that the healing school will be kick-started by 11:30am to 1:30pm daily just immediately after the morning session right inside Canaanland. Are you having sicknesses and disease that tthe doctors has said that there's no remedy? This particular session is for you specially and for all those oppresses and need a touch of the spirit of God. Shiloh 2015 Business Summit – This is a session for financial breakthrough and freedom. All business oriented individuals, businessmen and business women are expected to be a part of this particular business session. The time is sheduled for 11.30am to 1.30pm daily. Shiloh 2015 Youth Alive Forum – Youths of grades from age 18 and above, this is the session for you all. The Youth Alive forum will start-off by 3pm and ends by 5pm daily. Issues pertaining to all the youths will be discusses here e.g. love and relationship matters, dating, preparation for marriage, godliness, prevent/use of drugs etc. Shiloh 2015 Evening Session – This is the much anticipated programme of Shiloh 2015 Live Telecast and you must not miss any of it. The evening session starts by 7pm and runs till 10pm. The presiding Bishop David Oyedepo himself will be teaching during the evening session. Please note: Shiloh 2015 Live streaming will be transmitted here live by visiting the link below. 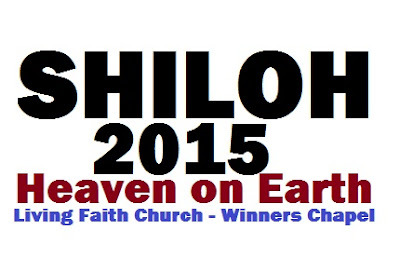 LIVE VIDEO: Shiloh 2014 'Heaven on Earth' (Winners Chapel) - Living Faith Church. Watch Shiloh 2014 Winners Chapel Live Online Broadcast . Shiloh 2015 youth alive live streaming updates.